Our last concert of the season began with accolades for Cheryl Anderson’s recognition by the Santa Cruz Arts Commission as "Artist of the Year." In addition to this, Cheryl directed the more than 80 voices in this memorable program, devoted to Gustav Mahler’s 2nd Symphony, popularly known as the Resurrection Symphony. This large work displayed Mahler’s optimism for a life hereafter, while simultaneously revealing a likely anticipation of his own death, caused by heart disease, in 1911. Despite his frail health, Mahler was a child prodigy, a star in his own family, and generally charismatic in the field of music throughout his life. Admired as a great conductor, Mahler was also a poet, setting his own words to music. Toward the end of his life, much of Mahler’s success was owed to his very capable and energetic wife, Alma, who managed to move their entire household twice yearly for four years between Vienna and New York City, where Mahler held contracts with the Metropolitan Opera and the New York Philharmonic. He felt entirely dependent upon the abilities of his wife in all matters concerning his career. This great symphony was so magnificently presented as to pull out all of the stops, just as Mahler had wished. As pre-concert lecturer Chris Pretorius quoted Mahler, “It used all musical instruments available to the music world.” At the Mello Auditorium, this included more than 80 human voices plus two soloists, and over 100 instrumentalists onstage as well as offstage and arranged throughout the corridors. Two conductors, Daniel Stewart and Nathaniel Berman, coordinated this remarkable effort, whose sound source was to be everywhere. Gustav Mahler had said, “I am thrice homeless: as a Bohemian among Austrians, as an Austrian among Germans, and as a Jew among the world.” At the time, Germany regarded itself as the owner of all worthwhile music, but until the 20th Century, concert music, to be taken seriously, had to survive Viennese standards. Professionally, Mahler was a star, rising from a child prodigy to a truly charismatic conductor of symphonic and operatic productions. The only force preventing his being considered a great composer was strong anti-semitism, which prevailed frightfully. The first movement of the Resurrection Symphony was a tone poem in sonata form that used Richard Wagner’s technique of combining lush music with program text. The movement was meant to commemorate a loved man who had suffered in life. 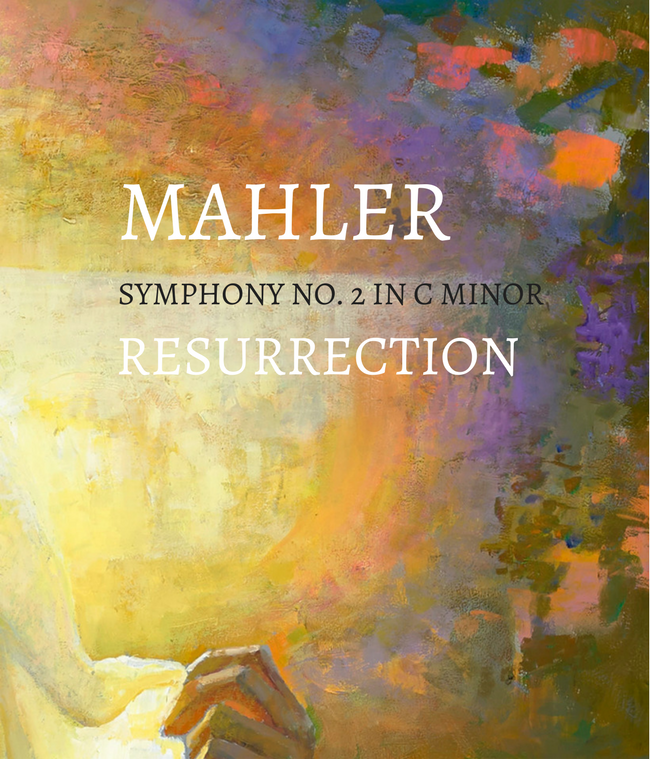 For Mahler, life after death would be bliss. The music contained an energetic martial theme in a minor key, with eastern thematic motifs. Great sonorities and dynamics punctuated by calm melodic passages made this a very Romantic work. A calm was followed by treble horns playing their own motific parts sequentially and prettily. The music instantly returned to a very strong, dissonant fortissimo that soon broke out into a light, bright episode, changing everything. Loud percussion quickly gave way to bright, melodic voices throughout this great work, with frequent mood changes separated by important silences. The silences were noteworthy. Did they save room for an answer to Mahler’s existential question, “To what purpose have you lived?” Has it all been worthwhile? The first movement took us through the funeral of a great man, whose life merited a long pause at the end, which Mahler stated explicitly in the score, “Here follows a pause of at least 5 minutes.” The composer was careful to indicate clearly his intentions to the musicians. Intermission followed. The second movement, marked in 3/8 time, used the full chorus and orchestra, with some instruments offstage. An elongated counterpoint section was very pretty with a light melody playing above a legato string melody. This was extremely romantic, but followed by an eruption of the same melodies rendered very loudly, as though injecting a little comic relief. Previous melodies were repeated in a pizzicato, ending with harps playing an arpeggiated tonic triad, twice. The third movement treated us to Jewish harmony in waltz time, upon which “Fiddler on the Roof” might have been based, played by a cleverly pitched horn. This was interrupted by loud fanfare, which, just as suddenly, softened. Mahler’s frequent mood changes in his music may have brought much of the criticism he suffered. His critics disdained Jewish dance, but he fortunately left it in. The earlier martial themes crept back in, followed by more Jewish motifs. Very loud tutti played a dissonant offering followed by episodic themes, then ended. Contralto Sara Couden introduced an entirely new phrase, “Oh, little red rose,” which the horns continued. “Humankind lies in greatest need. Much rather would I be in heaven!” A horn completed the musical phrase. A triangle kept time to Coudon’s next phrase; contrasting voices held forth beautifully, but all erupted into a violent measure—just as the lovely contralto had longed for eternal bliss! The violence, however, was shortlived, as full tutti played to silence. This short movement was filled with a variety of beautiful melodies shared sectionally by the orchestra. The fifth movement featured offstage instruments and the soloists, Sara Couden and Gabriella Reyes, who held forth beautifully. The answer to Mahler’s existential question also was revealed here. A very soft chorus of voices sang “Will you, my dust, after a brief rest,” while Gabriella Reyes held forth with “Will he who called you grant you.” Exquisite voices, all. The soloists shared Mahler’s own poetic lines against the chorus, assuring us “None live in vain; all must perish and rise again. Cease trembling and prepare to live again.” The violins rushed forth to support the vocalists. Reyes and Coudon sang a beautiful duet against perfectly blended choral voices. Tutti played a grand fortissimo until it ended with the familiar violin tremolo. Our ears rang as the organ and full orchestra with choristers and soloists sang to the end. It was a very grand finale to an extraordinarily grand concert season, greeted by a long, standing ovation for Danny Stewart and Nathaniel Berman, Cheryl Anderson, Nigel Armstrong, Sara Coudon and Gabriella Reyes, and all musicians and choral members, who crowded onto the stage to receive flowers, recognition and congratulations. This was a truly momentous finale to an already exceptionally well-received concert season. Unforgettable.